This paleohydrology workshop was the first in a series that was a response to area water managers regarding their need for information on climate variability and change. The workshop series is a joint effort between Arizona State University and the University of Arizona, supported by the Salt River Project, Central Arizona Project, Bureau of Reclamation – Phoenix Area Office, and the City of Phoenix. Attendees at the paleohydrology workshop included people from these agencies as well as Tucson Water, City of Scottsdale, the Arizona Department of Water Resources and the Sonoran Institute. The workshop was available via online streaming video and several people participated in that way. The goals of the workshop were to explore the applications of paleohydrologic data to water resource planning and examine the potential for using scenarios from paleodata for drought planning. To accomplish these goals, the workshop featured presentations that included background information on how reconstructions of past flows are developed from tree rings, information about reconstructions available for the upper and lower Colorado River basin, paleoflood analyses and data, applications of paleohydrologic data to water resource management, and an introduction to scenarios in water resource planning. A special feature of the workshop was a demonstration of the WaterSim model in the ASU Decision Theater. WaterSim is a simulation of water supply and demand for the Phoenix metropolitan area that integrates information about climate, land use, population growth, and water policy. 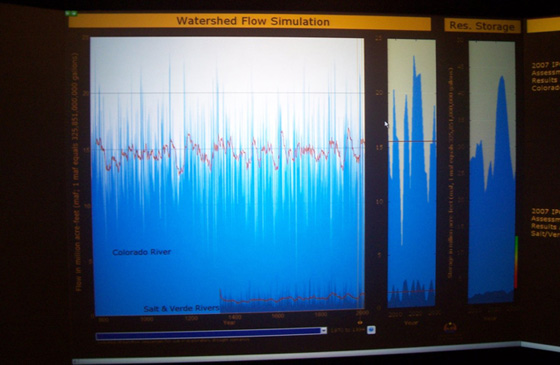 For this workshop, the reconstructions of Colorado and Salt/Verde river flows were used to run WaterSim, allowing simulations that incorporated the broader range of hydrology in the paleo records to be assessed. Thanks again to ASU Decision Center for a Desert City for hosting the workshop. In particular, thanks go to Katja Bruniers and Bill Edwards for making this workshop possible, and to the presenters and all of the workshop participants for their interest and engagement.